I have a Thing about old embroidery threads. An explanation of a Thing might be in order, so you understand me correctly. And if you’ve been reading Needle ‘n Thread a while, you probably gather that I like needlework books, and I’m attracted to good embroidery scissors. But my Thing about old embroidery threads is slightly different. The fact is, I don’t really like them the same way. I like the idea of them. I like looking at them, examining them, contemplating them. But I don’t like embroidering with them. This doesn’t stop me from occasionally collecting them or buying them – especially if I have hopes that they might be salvageable, and I know I can’t get them new, any other way. But more often than not, I’m disappointed in that regard. Because age affects embroidery threads. This is an Absolute – it’s a fact, and, in fact, for the rest of this article to make sense, you have to be willing to accept this fact. Age affects embroidery threads even more so if they are not meticulously stored with the intention of delaying the Absolute Certainty of the effects of age on the threads. And let’s face it: most embroiderers of old did not store their threads with museum-like care, to ensure the longevity of the threads. Heck, most of us don’t do that today! We expect to use the threads we have. And they didn’t do it 50, 75 or 100 years ago, either, because they expected to use their threads, too. I have all my grandmother’s embroidery threads from however-many-years-ago, and I want to know if I can still use them? Or: I found a whole stash of embroidery threads for a really good price at an estate sale and I bought them. They look really old. Can I clean them and use them? Let’s explore that idea a little bit. As we explore this idea of using old threads, keep in mind that, by old threads, I mean threads that have been more or less haphazardly stored for many decades. The threads the average embroiderer would have used forty or fifty years ago (or more), and that the average person (you and me, foraging about for threads) would find at estate sales, in attics, in old stock from old stores, and so forth. What I’m not talking about is older threads used at professional workshops or kept in museums and the like, that have been stored under optimum conditions. In the first photo in this article, and in the photo directly above, you’ll see some old skeins of #40 coton a broder. In the photo directly above, I’ve placed two new skeins of heavier coton a broder in blanc (not the 5200 bright white that’s available today, but just regular, everyday white) on top of the old skeins, so that you can perhaps see the difference between the old and the new. This difference between old and new threads is magnified because these are white threads. Whether your old threads are colored or white, chances are, if they are some 50 or more years old, they have the same type of grime, the same type of discoloring, going on – you just don’t notice it as much if the threads are colored. Besides the discoloration of the threads – which can be due to dirt and dust, to air and pollutants, to moisture or light, just to plain old aging – there is something else going on with the threads that you don’t notice right away, or might not even think of. Your eyes may not detect this other problem, but it is there, at least in some degree or another. I call it Thread Rot. Thread rots. That’s all there is to it. Cotton thread rots. 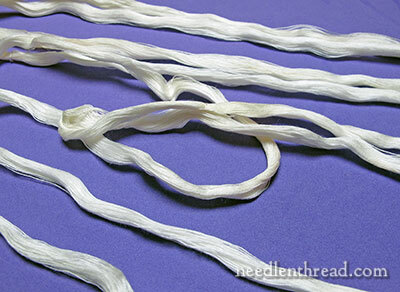 Silk thread rots. Wool thread rots. It’s a distressing idea, true. But it’s a fact: natural fibers decompose with time, especially if they aren’t meticulously cared for throughout their existence. Some fibers don’t rot as quickly as others. Silk will last longer compared to cotton, when under the same conditions. But…over time, thread rots. Thread rot is not necessarily discernible to the naked eye. But if you have old threads, and if they feel stiff, if they lack the suppleness that they had when new, if they have discolored with age, if they have little bits of brittleness here and there, if they feel thin or delicate compared to the same thread, new, chances are, there’s a bit of thread rot already going on. When can you be certain of thread rot? When the thread decomposes as you use it. When it shreds and falls apart much sooner than you expect it to. When it breaks too often at the eye of the needle. When it just… gives up the ghost. When it can no longer do what it was made to do. Age has taken its toll, and the thread has begun to decompose. Here, you can see little darker bits of discoloration on the thread. This looks and feels like a stain from another substance – not just discoloration from contact with something. And another substance adhering to a thread like this is just one more thing that hastens rot. In any case, can you still wash these old threads and use them? But… why would you want to? If you’re talking about a natural fiber that is already well into its Life’s Journey, why would you want to spend the time, effort, and frustration – and possibly risk the outcome of your intended project – by using threads that are past their prime and most likely on their way to decomposition? Is your intention to embroider something that you can enjoy for years to come? Something that you can hand down to your kids or grandkids? Something that you hope will be valued as art some day? Something that future generations will treasure? Then don’t use old threads – because none of the above will happen. The thread is already on its way out. Your work won’t be treasured for very long – or certainly, not as long as it could be, if you used new threads. Or does this describe you: You’re practicing stitching, having a little fun with crafty embroidery and the like, and you don’t really plan on the piece lasting forever – realizing that what you’re doing is just passing fancy, but you’re having fun learning how to do it, so… the thread doesn’t matter. You just want to learn, and you’ll work on the “art” approach once the learning is done. Even in the latter scenario, the thread does matter. If you are learning, don’t learn on something that is going to cause you frustration and grief, something that’s going to fall apart on you, something that’s going to give you inferior results. Don’t use that 75-year-old cotton floss you found in your neighbor’s attic… spend 50¢ or $1.00 on a new skein. Now, when it comes to using only slightly older threads that still feel ok, still look ripe and good and usable, but might be dusty and grimy, that’s a different question. And we’ll talk about that next time – how to clean these not-new but still usable embroidery threads and make them ready for use. Any thoughts? What’s your take on using really old threads? 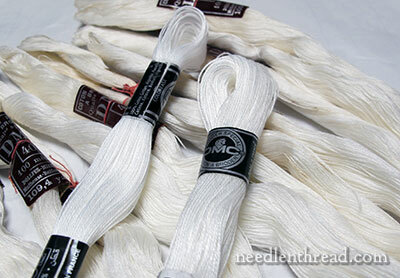 Have you experienced the effects of age on embroidery threads? Any tales to tell? If you want to chat the subject up a bit, feel free to leave a comment below! While you’re on the subject of threads, what is the best way to store them? I wrap mine around those little plastic square things and store in a plastic divided case with compartments? Thanks. I’m exactly the same! (But with new beads too, which is worse as they are more readily available, it’s often not a very limited supply left.) I think it’s just the way many beaders work. As one beader I know said, we’re magpie-dragons: attracted to shiny objects and then we hoard them like the dragon its treasures. This is a sad (but true) article indeed. I have a lot of “old threads” for which this is all probably true. I just could not resist skeins of thread that are no longer available — Coton Broder #100, etc. I have been slapped in the face with the dead fish of reality! OOPS! while looking up how spell polypropylene, I lost my message and train of thought. It’s what happens when the mind gets old. Hahaha. Well, you still have your sense of humor and that’s good! As a fabric recycler, I often get old threads delivered to me along with the old clothes I use to make quilts or pillows out of as family keepsakes. Depending upon the wishes of the client I sometimes use these threads, but most of the time I use new threads and will stabilize old fabrics with interfacing put behind them if they are frail. I always use fresh batting and backing, just as I would always use fresh ground fabrics unless the family wants something specifically made out of what they bring me. If I am making embroidered kitchen towels, or just putting names in children’s coats for labels, I will sometimes use my old threads for that type of utility stitching, or to do some restorative work to match what is already old and showing signs of age rather than create a patched spot in an old quilt or embroidery. If I can pull the thread or strands of floss and they break easily, I trash them unless on wooden spools and they become decorations in my sewing room. What is the proper way to store embroidery floss? Sometimes I use old threads for repair work on old pieces. Otherwise it is just frustrating to work with. Case in point, I was trying to couch some pearl pearl with a silk thread from my stash. In this application, I had only slightly stretched the metal to provide room for the couching thread. The thread didn’t show signs of wear, but it kept breaking when I tried to slip it between the pearls. Now I check my silk couching thread by giving it a little tug before I start. A very interesting, informative article. Your photos of the discolouration and stains really proves your point on old threads, in your comparative photos it’s amazing the difference in colour when compared to the new threads which probably isn’t noticable on their own. As you say why would you want to use really old thread when which rots when you can buy new thread relatively cheaply added to this the texture and lustre is better on new thread then very old thread, it’s a shame though especially if it’s a really loved relative who has left embroidery thread, still I suppose they are nice just to keep and look at now and again. Thanks for sharing this with us very illuminating. I’m 66 years old and I have the silk thread my mother used to embroider some baby clothes, a baby quilt and pillow(yes they put pillows in with babies back then) and I’ve been wondering if they could be used. Now I know what to look for. My best choice might be to display the threads with the quilt and pillow. I’ll wait until after tomorrow’s post to dig them out. To my dismay, I have used or tried to use some old floss for a project or two. I think the floss was not even 5 years old, but at the time, “It was such a great deal.” As I learned, no it isn’t. I agree with you that throwing away old floss is a lesson to learn. The only idea of what could be done with it is to give it to children to use as string that would be thrown away in time anyway. But even, then, I still think that a project is worth the price of new floss. Actually, when I decide I’m going to buy a pattern or start a project, I gather the pattern, the new fabric, and the new floss and put them in plastic seal-able bags. I am even likely to add a pair of scissors to the kit so I can just grab it and go. Just purchased a 1971 vintage Erica Wilson kit on ebay. The design printed on what looks like linen twill is bright and fresh looking. The wool threads in their original plastic bags were looked a bit dingy. So washed them in Dawn and air dried – really fast dry here in NM. I was going to use the wool until I read the above from you. Colors look bright now. I could easily match the wool with Appleton or even DMC floss. What do you think Mary? I Should mention that I wanted this kit when it came out in 1971. I could not afford it then but would love to work it now. It’s the Owls on a Tree kit. If the threads look good and feel good, give them a try! Wouldn’t hurt to try them – they may be fine! I’ve bought several Cathy Needlecraft Kits off the internet and the embroidery threads have been fine when I stitched them. Great article! Now I can get over my guilt trip of throwing away my floss from 1980’s! Thank you for all your info! Thank you for posting this info. It confirms my idea of framing my grandmother’s threads, needle cases, threaders and thimbles with an unfinished embroidery project in a shadow box frame – instead of trying to use them. I have tried to do crewel and needlepoint with older Paternayan wool and it too “rots” (discolors and weakens/shreds). this sounds as beautiful to me as stopping the hands of a clock and keeping it that way when someone passes away. Beautiful idea! I’m wondering what the implications are for old stitched pieces. I have a framed piece I did in the 80s with crewel wool. I love it, but wonder what the rot factor is. Should I even worry about it? What the heck, it’ll probably end up in some landfill someday anyway, but there is a chance one of my daughters might like to keep it. Several years ago I had an unfortunate experience using OLD floss on a redwork project. You probably guessed it. The red floss was so old it was not colorfast. So my advice is if you must use the old stuff check it out first and make sure it doesn’t bleed onto your project. NEW red floss bleeds too Connie! I don’t want to name names, but “colorfast” on the label is no guarantee that your thread won’t bleed on your project. Been there, done that with reds & several shades of navy made by a major producer & not hand dyed. You might try soaking/washing your threads first in a solution of vinegar & water. Commercial products also remove excess dye–Synthrapol etc. It’s an extra step that takes time away from stitching, plus you need to pre-plan rather than just pick up your floss & go. In defense of the manufacturer, however, so many dye compounds are banned, it’s a wonder we have some colors at all. My grandfather sold fabric and thread wholesale, so I inherited a stash of thread, as well as needles and stuff – antiques. This was sewing thread, not floss. I learned, however, that the thread had no strength; as you say, it looks OK, but it won’t hold a button on a shirt for long. I don’t know about rot, but it’s not strong like modern cotton thread (and most today is even stronger because it is partly synthetic). But it is the same with cotton floss, which is basically the same thing in this regard. It doesn’t keep in a home setting. Oxidation? Who knows. I am a hoarder but not ‘pathological.’ Now I can throw out that life long collection of badly stored boxes of old thread! Yup, I love to find stuff like threads at yard sales and second hand shops. A lot of times I don’t see how old they are till I get them home and try to match the colors with what I have already. Then I can tell. I have grand daughters that like making friendship bracelets, so I don’t feel like I wasted my money. Thanks for clearing that up, Mary. I’ve run across old threads from time to time and I have noticed exactly what you describe. I also have found there is often a moldering kind of smell that goes along with it that cannot be washed out,yes, I have tried. Sometimes I have felt a little disappointed to have to pass up old thread found at a good price. When people buy my work, however, they want something that will not disintegrate or smell bad right away! Your article on old threads was very helpful. I am being contacted by families of deceased stitchers who want to know what to do with the leftover stash including fabric and older threads. I was not aware of thread rot, but will keep it in mind. Great article. I guess I should throw out my MILs old threads. Felt guilty about doing that. But they just sort of look lifeless. I think you are right about using quality material even when learning. Poor materials or tools can be very discouraging. Thank you for your posts! You sent shivers down me spine this am! I started cross stitching in 1977. I am a have to have the entire collection gal. For many years, I meticulously added all the new colors DMC had to offer. To this day, I would bet I have about 90% of the color collection. So, am I to mourn over these “antique” threads that I spent hours winding on bobbins and have stored in cases for all these years? I can gaze upon them and fondle to my hearts content but dare not use now? I guess the bright side would be having to purchase new skeins! My husband will attest to my spending habits. LOL! Just for giggles, I will have to choose just one and purchase a new one and make the comparison. As far as storage: In 1977 I purchased a metal box called: “Jean’s Floss Finder”. It looks similar to a tackle box. It has two shelves. The top one lifts off the bottom. It came with cardboard ‘spools’ that you wind the thread around and mark the number on the top. For years, I searched for another. Not to be found anywhere. I did find another metal box that was exactly the same dimensions but a different color. It was a slide box (photo). Pretty much works the same way as my husband took the time and cut out the spools from chipboard that he painted white for me. Chris, I could not resist replying as my mother was the designer and producer of “Jean’s Floss Finder.” She just passed away on Christmas Day at the age of 91. She so enjoyed her time putting together and selling the floss finders. It was quite a process. My father designed and put together the die that cut the bobbins. She hand wound all the thread…. so glad people out there still use then and enjoy them! If I cannot find the thread made today….I use the old thread…washing it will tell you how much, if at all, the thread is damaged. suppose, so I threw them all out. My spontaneous thoughts are actually: what else can be done with old threads instead of throwing them away? As a hoarder (through heritage) and green academic, I hate throwing things away if there’s even a remote chance it could be useful for something, anything, especially things that have significant environmental impact when produced. Putting them in jar, displaying them, casting them in resin — anything to use them until they literally disintegrate. I have a bunch of old threads, crochet yarns inherited from my paternal grandma and aunt as well as a box of embroidery threads I was given by an old acquaintance of the family’s in the 90’s, some years before she died. The crochet yarns feel like a waste to just have lying around. The embroidery threads are a different story. They’re so beautiful and silky — I keep it like a treasure, just opening it to admire the gems and rarely have I even thought about using them. At least not embroider with them. They’re unique to me and, also, it’s the box and threads as a whole that’s a treasure to me, a memento of a person I knew and little piece of (modern) history. I certainly read with much interest your article today regarding old embroidery threads. how old are the threads that we purchase. My purchase and only available threads would be a JoAnn Fabrics or possibly a Michaels store, and as a last resort, to order via the Internet. I do have all of my Mom’s threads and I wash those before I use them. Mom was very careful about keeping the threads clean and protected. How do you answer purchasing threads today. I am sure there must be some online stores but for those of us who do not do as much embroidering, how do we know the age of those threads? Good article…but I feel it all depends on each skein and its particular condition – as well as what you want to make with it…I’ve couched down 80 year old very tender metal threads with new silk – because it created a certain look. But as with all things antique – understand what it is, be gentle and test, test, test to get the best part of the skein or spool. And then there is the definition of ‘old’…recently manufactured cheap thread that is out in the light and the heat and generally abused might not be as good as a meticulously stored 50 year old spool of Corticelli silk…I test each thread before starting a project, and I like using older ones in some cases as it creates a certain look and feel that is not available with newer products. In order to evaluate a thread one might find at an estate sale, etc., one must first know what the new thread would feel/look like. We also need to know how strong a particular thread should be. For example, I know just how strong of a tug new 6 strand floss will take before breaking. If it breaks too easily, I know that thread has not been stored adequately enough to preserve it’s strength. In other words, it’s rotten. But first we must know what “too easily” feels like for that particular thread in new condition. ; ). If the threads are special in some way, I think it is well worth trying them out as long as you accept that the article may not last as long as if you used new threads. I inherited some lovely filament silk thread that belonged to my mother-in-law’s mother-in-law and is probably from the 1920’s or 30’s. The sheen on it is gorgeous, and having been kept in the original paper wrappers, it still looks bright and clean. I used it to stitch a little decorative piece for my own enjoyment, and I really enjoyed using threads that had traveled through the generations of the family. I’ve bought old thread (and old yarn) fully aware it might not be useable. But if it’s on a wooden spool, then I know I can at least use it as a decoration. I inherited some old kits, but I haven’t examined the thread for rot yet. I’d like to finish them using the same thread. How would you suggest storing threads/kits to minimize rot? Obviously in darkness, cool, but anything else? Are plastic bags or plastic tubs ok or should I try a cloth bag? For years, I have wound my DMC floss on cards and stored it in the divided boxes. I like the system, and I don’t even mind winding the thread on the cards. It certainly stays clean and organized. But will it deteriorate faster because it is on cardboard in plastic? Mary, I am 100% in agreement with your assessment of old threads. it might be fun to hold onto something vintage and it might even have sentimental value, but do not use it. I learned this while quilting. I use only high quality quilting threads for my quilts and I always have leftover spools. Some even untouched if I purchased too much. If they have been ‘on the shelf’ too long, especially unprotected, I do not use them for something as precious as my hand work. There is nothing more heartbreaking than watching the work of your hands and heart literally fall apart. It’s just not worth it. I always buy new unless I am certain of the integrity of my threads. Because of the experience in quilting I have the same habit in my embroidery. It was difficult to get to this mindset because I come from a background of ‘use what you’ve got’. I have to admit, most people who want to quilt or embroider or even knit and crochet have the ‘use what you’ve got’ mentality still. They look at me with glassy eyes and mouth hanging open when I want to discard my old stash. I have an old box of coton a borderer with the old label of Clark Anchor. It is set in a box labeled Clark & Co. Paisley (Scotland)? I assume it is old, but not sure.! Checking the net( as one does) Clarke & Co. Paisley were a rival to Coats Anchor. Set up in 1865 and holding the registered trade mark until the 1950’s. There is still a trade office in Glasgow. If you have a label you could scan it to them and ask them to check to see if they can tell how old they are. Totally agree. Bought a whole bag of sewing threads at an antique show and the outer layer was dirty, but figured I could peel that away and have clean threads to work with. Threaded up my needle and every single one of them broke apart. A waste of $30 and my enthusiasm went down the drain! I was using some yellow thread a few years ago. I started using what was wound on a cardboard bobbin (which was stored in a container with a closed lid for maybe 10 years) then I threaded my needle with the new skein I’d just bought. They were not the same color! The numbers were the same, but the colors were not. I have also added some thread to a bobbin, and it was not the identical color to what was already there. These were all DMC threads. I think the colors changed over time. I don’t know if it was DMC who changed the colors or if aging did it. I know I am straying from the point again but it is relevant. Not using second-rate materials when you are learning or practising is crucial. When I first began painting with watercolour, in an effort to save money, I bought student-quality paints but my work was, well, rubbish. Another student managed to have beautiful passages of green lawn while mine were patchy and horrible. I asked her what paints she was using and she told me she always used artist-quality paints from a reputable manufacturer. I immediately bought some and the improvement was unbelievable – it wasn’t that I was a lousy artist, it was the materials that were making me so. I know the old saw about a poor workman blames his tools, but in this case it was true. And it is also true of needlework – threads, needles, fabrics: the whole kit and caboodle. So when Mary tells you to throw out the old, ‘rotten’ threads, believe her. She knows of what she speaks. Old “rotten” threads could be saved for stuffings, they still have a use even if its not for stitching. I inherited my grandmother’s and mother’s stashes; some threads could easily be 80 years old. The cotton seems to have held up fine and I’m happy to use it, stranded/floss, floche, broder, perle and crochet/lace. 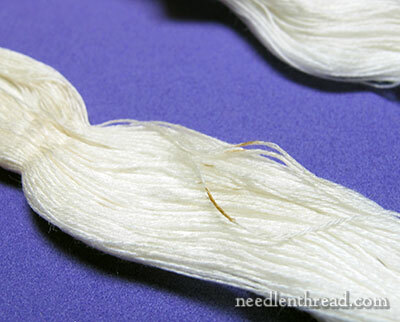 The rayon (‘art silk’) filament is fragile, though, and the perle-style rayon thread falls apart at the slightest friction. I found this so interesting. I have some older floss and this is valuable information. I was curious about wool thread. Can you do a short piece on that? Just thinking that other things can happen to wool over time. I am thinking of some I have encountered over time that seemed to have gotten almost felted. I get lots of ‘left overs’ from others. Oh how painful…. but true. I have a box of silk threads that were kept in paper sleves and a box. I have often thought of using them but always changed my mind wondering if they were still good. Now I know. The other problem I have are cross stitch quick kits (think Chirstmas ornaments), that have thread from China. The embroidery thread is just terrible. It breaks, tangles,and colors always fade. I like the pattern but always change the threads. Now I`ll step down from my soapbox. As a custom needlework finisher, I can agree with your thoughts on the use of aged threads in a new piece. Through the years I have had to deal with clients that have used aged “stash” in a piece of canvas or counted embroidery. It never pays to start a background with “Aunt Alice’s yarn from her trunk”. Inevitably, the embroiderer is left with a small unstitched area that cannot be matched in either thread/yarn or color. Also, the thread rot and color changes in a skein will jeopardize the beauty and longevity of a piece that the embroiderer has spent many hours of time and effort creating. Thanks for bringing this concern into the public eye. I don’t think that many realize that the small savings of money can cause so much dismay in the end. Too true! I just keep these old threads to look at and remember old times…. Excellent article Mary! I inherited a lot of embroidery floss from both my grandmothers and most of it I’m still able to use. Some of it it showing signs of wear and those I generally get rid of. Sometimes just removing the outer layer of thread on the skein/spool will yield something that is useable inside. I always check that possibility before I trash any threads. So pleased to read this article – thanks. I ‘inherited’ my Grandmother’s old floss and never used it because it was old and probably fragile, I thought I was just being silly but I can see that I was justified in my decision. I completely agree with you, and as much as I like the idea of vintage fabrics, I think I would prefer all new fabric as well, for all the reasons you stated! I plead guilty to buying old thread on ebay! I once bought a full box of 24 spools of linen sewing thread for €35! The label gives a city in the North of France and the name of a long-dead brand. 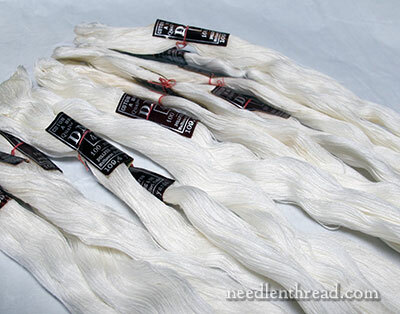 The color of the thread I bought is a lovely natural cream, the thread is a fine 3-ply “retors” and has a very nice natural shine. It is flax, i.e. linen, that’s the main reason I bought it because even fine, it is strong. I have also bought some DMC white coton à broder in an unopened box. Haven’t tried it yet but it looks fine. So if I ever again feel the urge to splurge, I will remember your timely article, Mary. ..but the linen was ok, right? I have bought and used old (40-50 year old) embroidery linen (flax) thread since 2009, and it’s been as new, no difference. 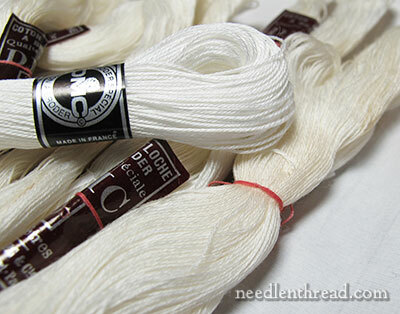 I heard from a reseller of linen and cotton embroidery yarn that cotton ages badly, linen doesn’t. I just got some needlework & sewing items from my Mom…I’ll remember to give a tug-test before using. And not feel bad about tossing if bad. OTOH, if I found a bunch of silks, I’d be hard pressed to toss those – I’d probably wind them nicely on something and use them for display only. The only silks I’ve ever found save me the work by by being a tangled filthy mess in the bottom of a box. Oh Mary, I would never toss my old threads! I have quite a stash of rather old goods from the late 1800’s to early 1900’s. Many are unlabeled, many are from companies that are no longer in business. And I do use them. When I handle these old threads it makes me think of where they came from. Who grew the cotton? Who processed it? How many places in the world did they travel to before ending up in a box in my room? Although an awful lot of them are weak and unsuitable for embroidery, they still have a chance. I make trim with them! They are just fine for for making into tassels or twisted cord trim on a Christmas ornament. There is no stress on them when used this way, so weakness isn’t a factor. Yes I am using them…. I am completing some of the work my Mother didn’t finish as keepsakes for her granddaughters… The items will be worked as pictures, framed & protected so I do expect them to last for a long time to come…. Thank you once again. I love reading your email and learn so much from you. I’m a hoarder and hate throwing out but have noticed that some old embroidery thread has discoloured not realizing that it was rotting so next on my list will be to throw out any old stained thread. I guess that goes for cotton machine thread. I have been hand quilting hexagons and find the thread keeps breaking so bought a different brand but now realize it is very very old. I’m well into my sixty’s and love sewing and never enough time in the day to do all I want. Thank you Mary for rekindling my love of hand sewing. I just found this article, and thought it was very interesting. One thing that can be done with old, rotten threads, is you can cut them up into short lengths and put them out in your yard for the birds. It sounds weird, I know, but many birds pick up hair and things like that to make nests with. I often set out little bits of thread that aren’t long enough to use near our backyard feeders. I have some old embroidery patterns from my mother who is 102. I am clearing out her things and wonder if you know anyone who would like them. Hi, Joan – thanks for your note! Can you email me at mary(at)needlenthread(dot)com. I’d love to hear about the patterns! I would like any that are of birds, or oriental in design. My hard-worked Bargello, that I worked in 1975 with Anchor silks (sorry, I don’t remember exactly which I used) has started to rot, starting with the pinks. The Browns are unaffected. It has not been in the sun. It is awful to behold. You can use Biz to clean silk embroidery..just wash in very diluted, rinse well with cool water and fan dry so it dries quickly you can roll it gently in a towel first. I swear by it. Woolite for darker colors works well. Use same drying techniques. I totally agree with you on old thread and its decomposing. With one exception. DMC Moline Special is Vintage and if it has been stored in its original box with tissue paper is the most gorgeous floss I have ever seen. The colors are richer and the threads are quality beyond what they are making now. I just purchased several boxes from an eBay seller and I was very fortunate to find these 1500 + skeins in their original cases for $150.00. I am still in search of this fine floss. They are so pretty ! Also Thread Magic is the best thread condtioner for cross stitching. It protects the floss…makes it a breeze to separate and preserves the colors. Excellent tool! Hi, I was wondering, if u no the colors to these numbers,0010,4552,1142,7252,7772,7882,7992,6772,6792,9992,6992,7332,7672,2732,2752,8122,8832,8862,8872, im trying to do a project w/ these color embroidery floss and I don’t no the colors, hopefully u can help me plz ty? Hi, Jody, I’m afraid without knowing the line of thread or brand, I wouldn’t be able to match up numbers. Hi, I store my floss on the plastic spools if it’s new and in Baja slide cases. While not air tight, it keeps the floss in excellent shape; clean and readily accessible. The drawers are made of bakelite or have plastic inserts and some have slots in them which hold the spools in place and colt id’s are easily read. As far as vintage floss, I buy the DMC floss in the original boxes which have tissue paper around them. All of this floss is stored in their boxes inside a wooden trunk. They are stunning and much richer in color then what you can buy today anywhere. I will purchase floss that has been stored in sealed plastic bags. eBay and Etsy have a lot of vintage floss for sale as well as discontinued colors. If you would like pictures as to what I have described please email me. Happy stitching! Just came across your “Thread Talk” article as I was researching old embroidery floss…don’t know if a comment is still welcome or will go through, but here goes! We recently purchased a home that is not so old…but had many old and vintage items left in the garage storage area. These items had belonged to the owners’ mother and grandmother, so some go back quite a few years! As we are sifting and sorting I find myself wondering about the people behind the ‘things’ and especially when I come across personal items…photos left behind, old letters, floral cards from someone’s funeral and, my most recent find, two hand-made fabric and cardboard booklets storing skeins of embroidery floss, one color per page. I love to cross stitch and embroider and have floss boxes full of wonderful colors of floss, but these two books really touched me. Someone took the time to cut up what looks like an old bed sheet and some cardboard and stitched them together to hold their lovely colors. I wonder what they were working on when it was put away for the last time? Now I know I should just put the whole thing in the trash…the embroidery floss is not usable after so many years of storage in a damp cardboard box kept in a damp attic and has (I am sure) been walked over by many small-footed creature searching for something soft for a nest! And I am sure it will go in the trash eventually…I just can’t bring myself to dispose of it yet…so I will clean it up with a damp cloth the best I can and continue to wonder and marvel at the creativity of people! Hi, Janet – Ahhhh. That is hard! I have a difficult time throwing things like that away. I’m sure there’s someone out there can think of some way to repurpose it or something, but I’d be inclined, I think (eventually) to throw it away. Old threads pose a difficulty. There’s the “emotional” attachment to them, and the desire not to pitch something that is, in a sense, a part of someone’s history, anyway. But on the other hand, they are rarely usable for anything. And if you store them… well, someone else will eventually throw them away, I think. I’m sorting right now through a lot of my collection of embroidery-related things that I’ve kept for a long time, that I know have no use to me or anyone else. Old threads that are beyond using, things like that. I’ve had to bite the bullet and get rid of them. In the long run, I think it’s better than amassing a collection of goods that no one will ever see, that I can do nothing with, and that takes up space. Next Next post: Monograms: The Art of Embroidered Letters – Winner!